In 2017, we witnessed the rise of cryptojacking malware. A common target was compromised websites and their unsuspecting visitors. How cryptojacking works illustration by the European Union Agency for Network and Information Security (ENISA). This process is very intensive and can use all the CPU resources of the victim’s device. This leads to higher energy usage, rapid battery drain in mobile devices, and can cause damage from overheating. 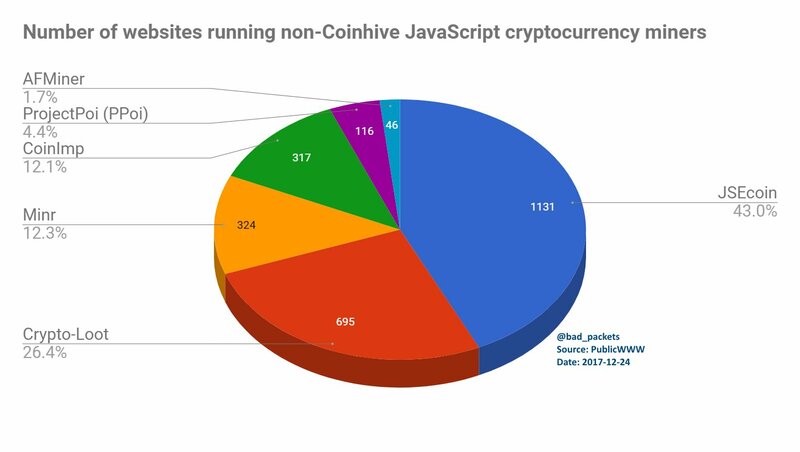 Many well-known websites were compromised in 2017 with cryptojacking malware. For an entire weekend in September, subscribers of Showtime’s video streaming website, Showtime Anytime, were subjected to cryptojacking. Back in September, I was the first to document the cryptojacking incident of CBS’ Showtime Networks’ websites. Coinhive malware was found to be present on video streaming site ShowtimeAnytime.com for three straight days. Showtime has refused to comment as to why the code appeared on their websites. While the Coinhive code was found in a New Relic code block, the company’s spokesman denied any responsibility in the matter. 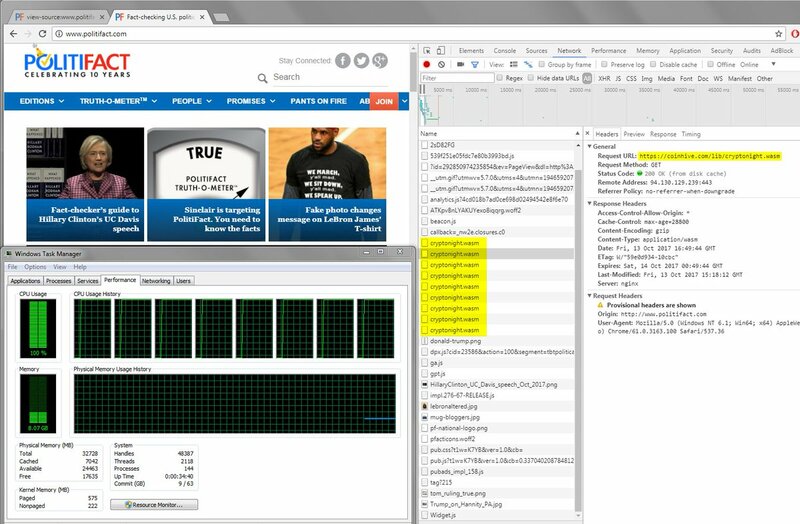 Hackers embedded Coinhive on Politifact’s website after compromising one of their AWS servers. The cryptojacking of UFC’s Fight Pass website went viral on Reddit as multiple users confirmed the presence of Coinhive. Early in November, numerous users reported the subscription video streaming service of the UFC, dubbed Fight Pass, was running cryptojacking malware. 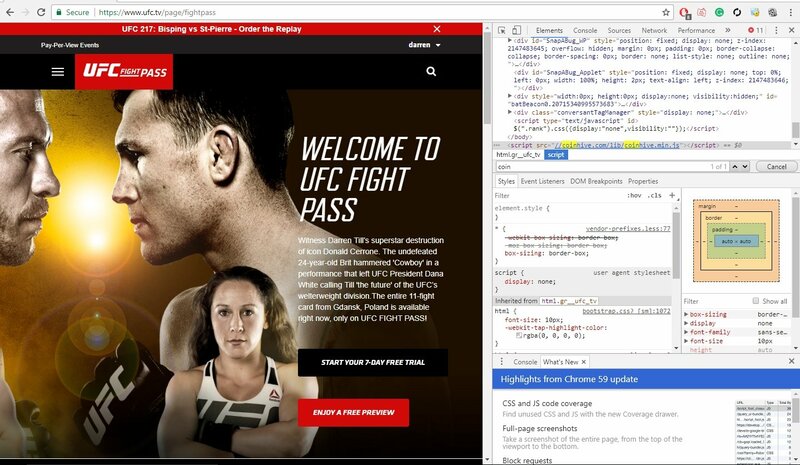 A UFC.tv customer saved a copy of the source code (above) where Coinhive was found. However, in a statement released to me (below), the UFC denied the code was ever present on their website. 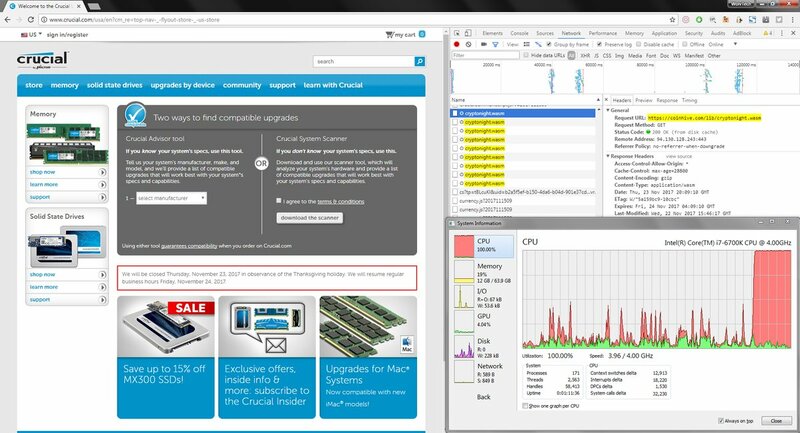 The cryptojacking of Crucial Memory and Everlast’s website was due a compromised live help chat widget. On Thanksgiving Day, I found a large cryptojacking campaign of 1,400+ websites. 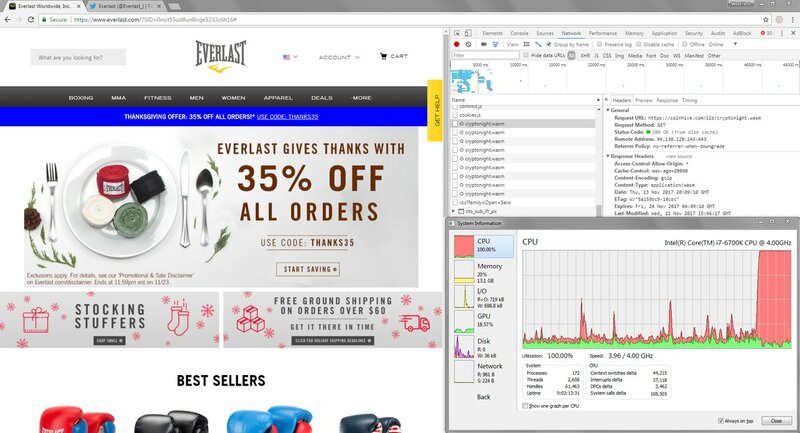 The two most nobables sites were of Crucial Memory and Everlast Worldwide. Normally you would never associate these two brands together, however both their websites shared a similar embedded code — a live chat widget provided by LiveHelpNow. LiveHelpNow stated one of their CDN servers was compromised and injected with the cryptojacking malware Coinhive. 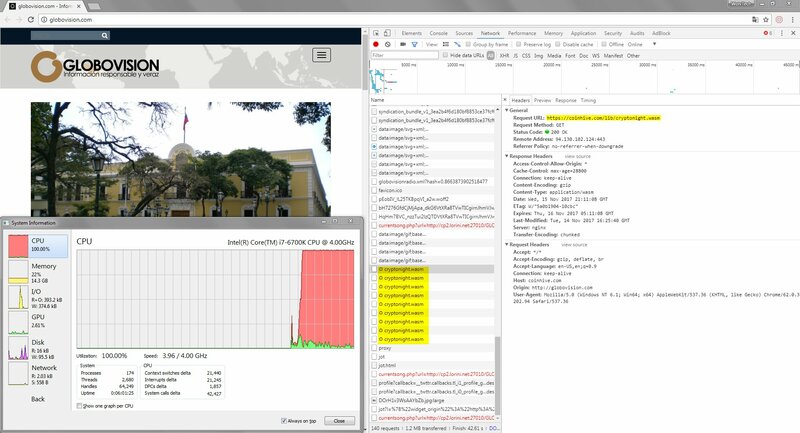 Google Tag Manager was used to inject Coinhive on Movistar’s and Globovisión website. 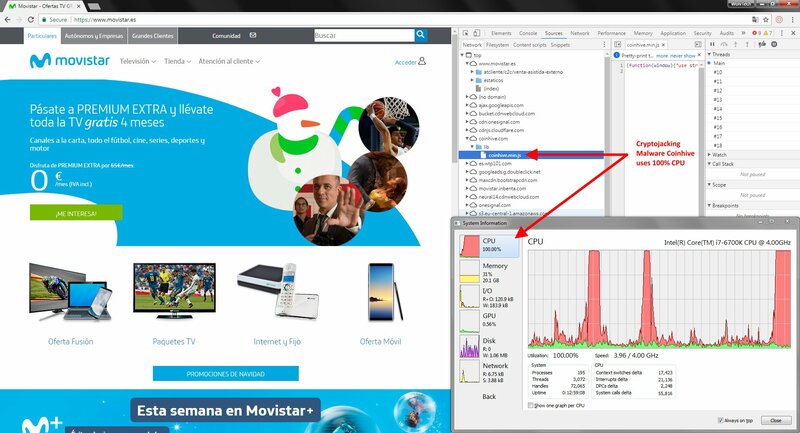 In two separate incidents, I found Coinhive was injected into the websites of Globovisión and Movistar using Google Tag Manager. Movistar stated that Coinhive was not put on their website by a hacker, but instead was due to “an internal error” while they were conducting “pre-production tests.” No statement was provided by Globovisión on why the cryptojacking malware appeared on their site on November 15. Multiple users reported the cryptojacking behavior of the “Archive Poster” extension. Cryptojacking was not limited to websites in 2017 as we saw Chrome extensions also being affected. 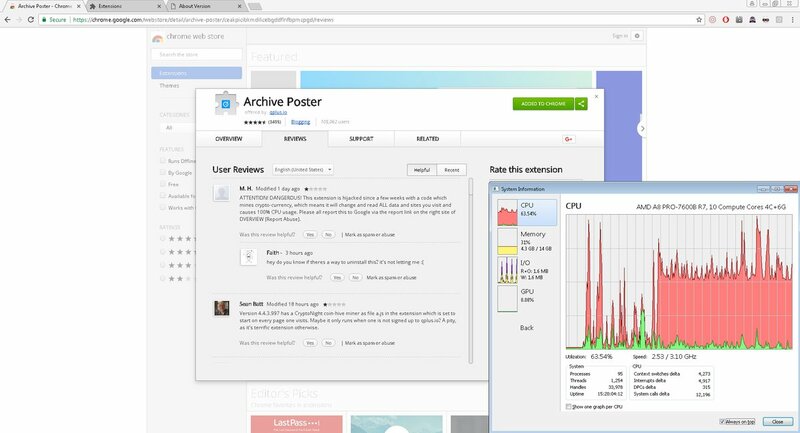 One such extension, Archive Poster, remained on the Chrome Web Store for days while silently cryptojacking an unknown portion of their 100,000+ users. Despite multiple user reports, Google’s response lacked any initiative to remove the malware infected extension. After I reported the issue to them, it was finally pulled. One of the up-and-coming Coinhive knockoffs, Minr, offers built-in obfuscation and uses multiple domain names to evade detection. Domains used by Minr malware change frequently. Heading into 2018, the question remains how to stop the spread of cryptojacking malware. Luckily we have seen anti-mining browser extensions, such as No Coin and MinerBlock, developed to help curb the threat. Another popular ad blocker, uBlock Origin, blocks most cryptojacking scripts now as well. Many anti-malware applications, such as Malwarebytes, have started blocking the effects of cryptojacking.